Nokia BH-905 review | What Hi-Fi? At £200, this chunky set of Nokia 'phones here marks a big jump in price over the £60 Nokia BH-504 – though you can find them cheaper. You get bigger ear pads and a thicker, more cushioned headband, complete with a curious, slanted design. 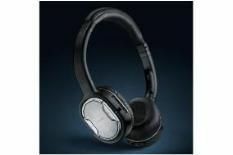 Still, they're comfortable and better envelop your ears – ideal for the ace in the pack, noise-cancelling, charged by a USB power cable. Again, controls are on one ear. Sonically, they're a muscular, detailed and musical proposition, and there's punch, dynamics and emotion to vocals, with Mount Kimbie's Maybes offering subtelty and weight. There's no apt-X support, and they're pricey, but a Bluetooth range of up to 20m makes this a solid buy.